Follow My Adventures on Facebook! Are you hosting your family Christmas dinner and stuck on the perfect centerpiece for your table? Stop worrying as anyone can make a beautiful centerpiece for their dinner table. 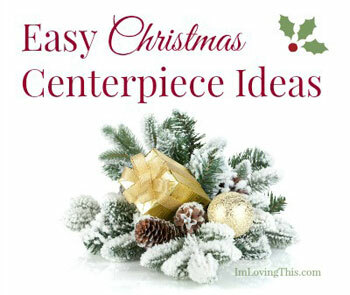 Here are a few Christmas centerpiece ideas for your dinner table this year. You put them on the tree so why not use them on your table as well? Stack some ornaments decoratively together with some glue. Add some sprigs of pine to it to hide the glue and to create a more festive look. Then place it in a bowl at the center of your table and surround it with candles. You could also pick up a glass votive if you don’t already have one and fill it with ornaments left over from your tree, no glue needed. Cranberries are very festive and you can create some elegant centerpieces using cranberries and candles. Take a few big glass candle holders and fill them about 2/3 full with cranberries. Then add water leaving enough space at the top for a candle. Top with the floating candle and then you have a beautiful, simple centerpiece. You could also use a big bowl and put multiple candles in it with cranberries and water, the possibilities are endless. Grab a few festive boxes of varying sizes and colours/designs and a cake stand. Place the boxes/presents onto the cake stand to the desired height and top it with a big, beautiful Christmas bow. Go outside and gather up some twigs from the yard. Place them in a glass pitcher and hang some ornaments from the twigs. You could also string some of those mini led lights around the twigs. You can also find some fake, snowy twigs at your local craft store if you don’t have any twigs laying around in your yard. You can also use pine cones to create a beautiful Christmas centerpiece. You can spray paint them either silver, gold, white or just leave them as is. Arrange them neatly in a bowl or spread them along your table runner. Do you have any of those old big Christmas light bulbs that were used years ago? If you do then grab the bulbs and place them in a clear bowl and place a large candle in the center. You could even spray paint the bulbs if you don’t like the vintage look. Did you or your kids build a gingerbread house? Why not use it as your centerpiece, simple and festive. You could surround it with some pine sprigs, pine cones or even fake snow. Centerpieces are fun, festive and always complete the Christmas dinner table. They can be really easy to make and inexpensive too. You don’t need to spend any money on one, we all have extra decorations sitting in boxes so just use what you have on hand to make something beautiful. Check out my Pinterest board for more Christmas decor ideas. Great ideas! This year I put a bunch of pinecones in jars and placed them around my living room. I received several compliments about them. Learn good sun habits and myths so you stay looking young longer. Check your inbox to confirm your email address so you can receive your free download. Copyright © 2010-2018. Proactive Executive Solutions.